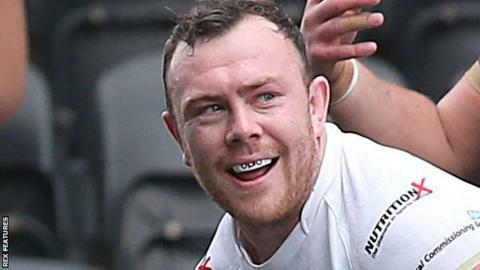 Widnes Vikings won their final game of the regular Super League season as they consigned Catalans Dragons to a sixth consecutive defeat. Corey Thompson put Widnes ahead before Dave Taylor went over for the visitors, but Todd Carney missed the conversion. Patrick Ah Van further extended their lead before Thompson's kicking helped the hosts to a 14-4 lead at the break. Joe Mellor, Aaron Heremaia and Stefan Marsh all went over in the second half as Widnes coasted to victory. The Vikings, who were already assured of a top-eight place going into the match, moved up to seventh in the table ahead of the Super 8s. Marsh's late try and conversion took him past the 250-point mark for the club in all competitions, on his 100th appearance. Catalans, who finished fifth following St Helens' win at Wigan on Friday night, are without a win in all competitions since 11 June when they beat St Helens 33-16 to go second in the table. "Defensively, we were really good and we were also clinical in attack. It was a hard-fought win and the pack were outstanding. "Kev Brown was really smart going for penalties to keep the scoreboard ticking over in the first half. "We are only three and four wins behind Catalans and St Helens and we are setting realistic goals to push ourselves into a higher position. "We have not been out of the eight all year and we are now looking forward to playing the top teams. We are in a decent place as a group. Joe Mellor has been outstanding all year. "It was very disappointing. I was happy with the first 20 or 25 minutes but then we didn't respect the ball enough and conceded some soft tries. "It is frustrating but we have two weeks now to regroup and make sure we reach our objective. "It has been a tough last month with injuries but I am confident for the next few weeks. "Todd Carney has been unable to train for two weeks but wanted to play today to help his team-mates." Widnes: Thompson; Marsh, Runciman, Dean, Ah Van; Mellor, Brown; Burke, White, Buchanan, Whitley, Houston, Cahill. Replacements: Leuluai, Heremaia, Manuokafoa, Farrell. Catalans: Gigot; Broughton, Garcia, Duport, Yaha; Carney, Albert; Taylor, Pelissier, Casty, Stewart, Horo, Baitieri. Replacements: Bosquet, Maria, Da Costa, Navarrete.